Jim Lawson (born February 19, 1960) is an American comic book artist best known for his work on the Teenage Mutant Ninja Turtles series. 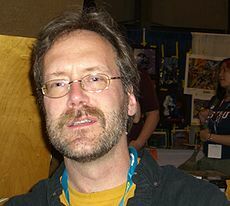 Lawson created the Rat King and also co-created the series Planet Racers with Peter Laird. He is also the writer/artist of the black-and white-comic series Paleo: Tales of the Late Cretaceous. For more than 20 years he was the author and artist of TMNT comics, but in 2009 he announced that he’s departing from TMNT. Lawson was a participant in the 1988 drafting of the Creators’ Bill of Rights.